Beastie Boys bassist Adam MCA Yauch has revealed their forthcoming new album has taken the rap collective in a "bizarre" new direction. "It's a combination of playing and sampling stuff as we're playing, and also sampling pretty obscure records," he said of their eighth studio LP. They have tentatively named the record Tadlock's Glasses, after a former tour bus driver, who was once presented with a pair of glasses by Elvis. The band are set to tour in the summer. Speaking to BBC Five Live at the Independent Spirit Awards in Los Angeles, Yauch said the collective are currently putting the finishing touches to their new album. "We're tweaking some mixes and we're going to master it in the next couple of weeks," he explained. "There are a lot of songs on the record and there are a lot of short songs and they kind of all run into each other." The record comes nearly two years after their Grammy Award-winning instrumental LP The Mix-Up. Of the title he explained: "We had a bus driver years ago who used to drive Elvis' back up singers. "His name was Tadlock and Elvis gave him a pair of glasses which he was very proud of. So for some reason that title - Tadlock's Glasses - has just been bouncing around." 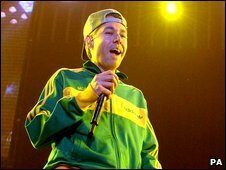 Although no firm release date has been set for the record, Yauch said the Beastie Boys would return to the UK for a series of tour dates in support of the album later this year.